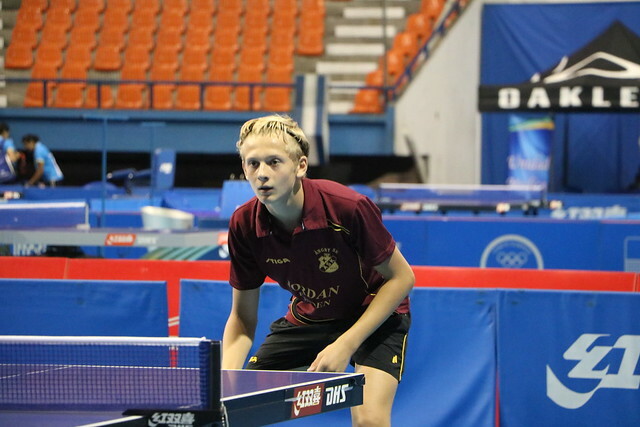 Success as status advised, the top seeds in both the Cadet Boys’ Singles and Cadet Girls’ Singles events at the 2017 El Salvador Junior and Cadet Open, Panama’s Jacobo Vahnish and the host nation’s Monica Mendoza, both progressed safely to latter stages following success on Saturday 19th August. Jacobo Vahnish accounted for Puerto Rico’s Jabdiel Torres (11-2, 11-4, 11-7) to reserve his place in competition that has reached the quarter-final stage. Similarly, Monica Mendoza caused the Caribbean island problems; she overcame Brianna Burgos (11-5, 11-4, 6-11, 11-4) in an event that has advanced to the quarter-finals. Success for Jacobo Vahnish in a most impressive manner; it was very much the same situation in the remaining matches to determine the last eight places, the only players to experience any difficulties of note being Guatemala’s Luis Ton and Costa Rica’s Bryan Solis. Both needed four games to book their quarter-final places. Luis Ton beat John Lopez, like Bryan Solis from Costa Rica (8-11, 11-3, 11-8, 11-8); Bryan Solis accounted for Mexico’s Alberto Lopez (11-6, 3-11, 13-11, 11-9). Otherwise, as with Jacobo Vahnish, it was straight games successes. At the quarter-final stage, Jacobo Vahnish meets Costa Rica’s Alfredo Sanchez; Guatemala’s Sergio Carillo faces Puerto Rico’s Daniel Hernandez. Puerto Rico present in the top half the draw; in the lower half their players are prominent. Angel Naranjo meets Luis Ton; Gustavo Cruz opposes Bryan Solis. Meanwhile, in the Cadet Girls’ Singles event, just as Monica Mendoza enjoyed a comfortable quarter-final success; so did Fabiola Diaz, like Angel Naranjo and Gustavo Cruz from Puerto Rico. She accounted for El Salvador’s Cristina Machado in three straight games (11-4, 11-6, 15-13). Comfortable wins but in the two further round of last eight contests, matters were much closer. Mexico’s Maria Muñoz needed the full five games to beat Guatemala’s Mercedes Mendizabal (8-11, 8-11, 13-11, 11-3, 11-7), as did Sarika Ahire of the United States when facing Puerto Rico’s Kassandra Maldonado (11-8, 8-11, 8-11, 12-10, 11-8). In the penultimate round Monica Mendoza meets Monica Muñoz, Sarika Ahire opposes Fabiola Diaz. Play concludes in El Salvador on Sunday 20th August.